Great interview! Ali … just brilliant. Simple wisdom. Thank you so much for sharing. Stealing a line from an old show; Infinite Diversity in Infinite Combinations. I can’t tell how people differ or don’t from me until I define who / what I am. Just because I can define myself does not mean that I see everyone else “not me” as less than I. We have to celebrate not only our similarities but our differences. On the path of expanding consciousness there are different and rising levels. Krishnamurti betrayed what some call cosmic or mental consciousness – a high consciousness that sees all mankind as one and eternal peace on earth as a veritable goal to strive at. Soul consciousness or God consciousness are states beyond that and they teach you that life is perfect the way it is. We may strive and work for a better world, but we should be detached about it and take care of our loved ones, our own lives. As Soul we are absolutely equal only differentiating ourselves in experience and state, but never in potential. As humans we are totally different and we should embrace our differences, our gender, our race, our nationality, our customs, because all those things contribute to the richness and joy of our experiences. KRISHNAMMURTI, YOU ARE VIOLENT IF YOU SAY “i”, etc. I find liberals so hilarious, almost like children. I argue back with them and slash their delusions in a single sentence and they give me a blank stare. This is because they are never analyzed their own statements–they just parrot. 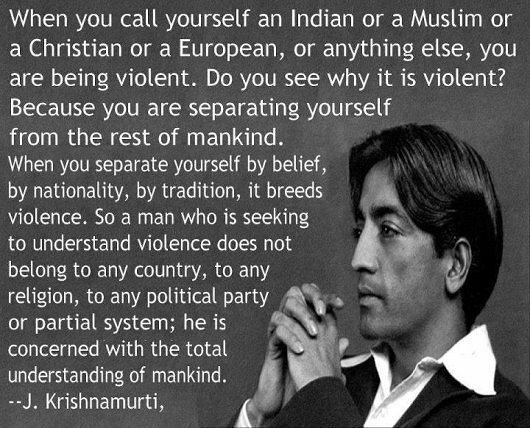 So if Krishnamurti thinks that specifying your own nationality is violent because it separates him from mankind, then by that same logic, he is violent by calling himself “I”, identifying himself by his own unique name, eating breakfast/lunch/dinner (and not feeding others instead), brushing HIS OWN teeth (not of others), because all these acts separate him from the mass of mankind, and therefore, by his own logic, are VIOLENT ACTS. Therefore, he is a most violent man, by his own logic.